Magical Innovation™ is the psychology of magic for business success. It is based on the most valuable of magicians' secrets - the psychological techniques used to affect perceptions and beliefs. Explaining why tricks work, rather than how they work, Magical Innovation™ allows anyone to communicate more effectively by focusing on what their audience is thinking. 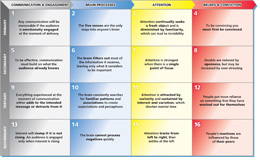 Together these form the Perception Matrix, a unique tool to control and manage perception.